Most UK television viewers will be aware of the Deal Or No Deal show hosted by Noel Edmonds in which some rather frantic contestants use potluck to open various boxes in the hope of winning cash prizes. 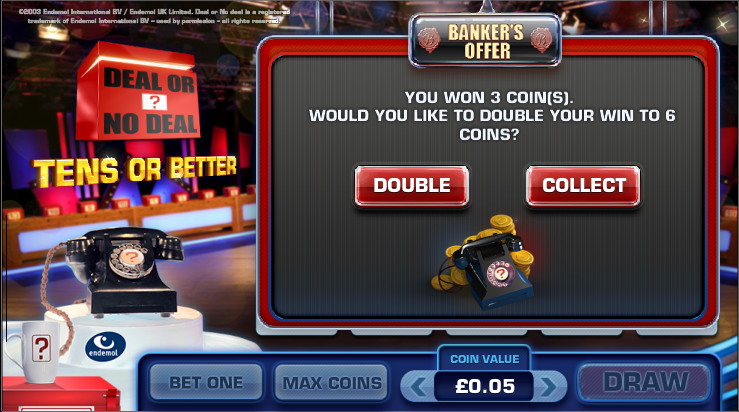 You can already play two themed online slots – Deal Or No Deal Banker’s Riches and Deal Or No Deal World Slot – and now there’s a version of video poker from developer Endemol called Tens Or Better which includes an option to gamble each win. 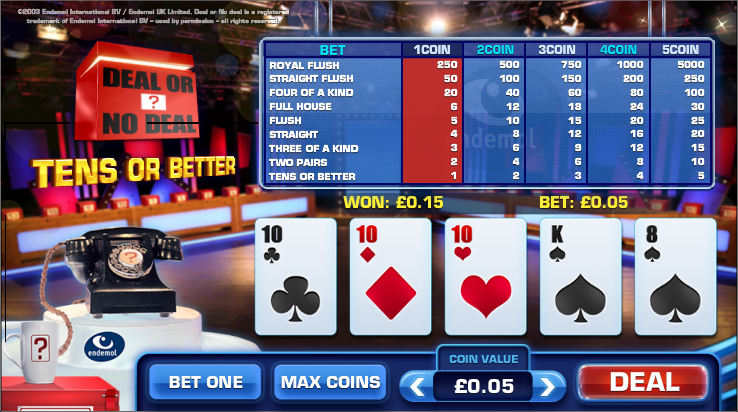 Deal Or No Deal – Tens Or Better is set in the same real-life television studio as the slot games with the famous banker’s telephone on the left hand side of the screen. Occupying the major portion of the screen is the paytable and the poker cards. Essentially this game is a version of video poker in which the lowest possible winning hand is a pair of tens – arguably the standard version is Jacks or better. Players have two draws in which to make the best five card poker hand according to standard poker rankings. The first thing to do is set your stake of between £0.05 and £2.00 then just click the big red ‘Deal’ button to receive your first five cards. You can now ‘hold’ as many of these cards as you wish but the more obvious choices will be automatically held for you. Press ‘Deal’ again for the second draw to find out how much, if anything, you’ve won and if you’ve been successful you’ll have the chance to play the ‘Double Up’ game which is probably only for those with a high tolerance to risk. There’s a maximum of five correct guesses here but you’ll lose your winnings with a wrong prediction. Remove the glitz and this is a fairly standard version of video poker with the added addition of the gamble feature. It should be noted that even though there’s a low winning threshold (a pair of tens), the RTP of 98.50% is still similar to Net Entertainment’s Jacks Or Better.